Ok, if you’re reading this post, you may want to read also the previous one that explains something more about the problem. Briefly said, if you have a CDB running on ASM in a MAA architecture and you do not have Active Data Guard, when you clone a PDB you have to “copy” the datafiles somehow on the standby. The only solution offered by Oracle (in a MOS Note, not in the documentation) is to restore the PDB from the primary to the standby site, thus transferring it over the network. But if you have a huge PDB this is a bad solution because it impacts your network connectivity. (Note: ending up with a huge PDB IMHO can only be caused by bad consolidation. I do not recommend to consolidate huge databases on Multitenant). So I’ve worked out another solution, that still has many defects and is almost not viable, but it’s technically interesting because it permits to discover a little more about Multitenant and Data Guard. 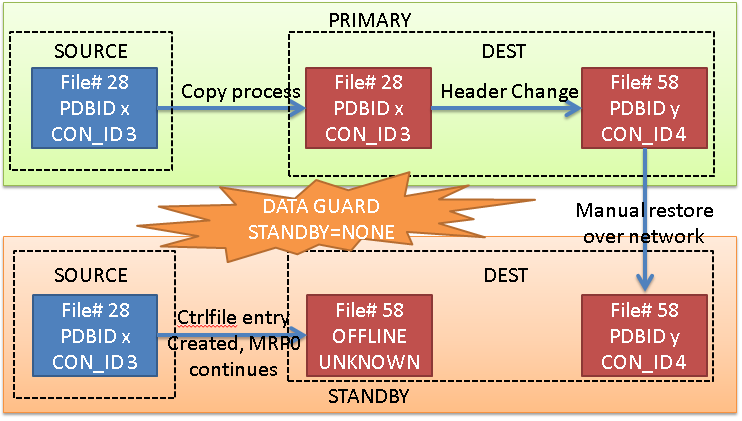 At the primary site, the process is always the same: Oracle copies the datafiles of the source, and it modifies the headers so that they can be used by the new PDB (so it changes CON_ID, DBID, FILE#, and so on). 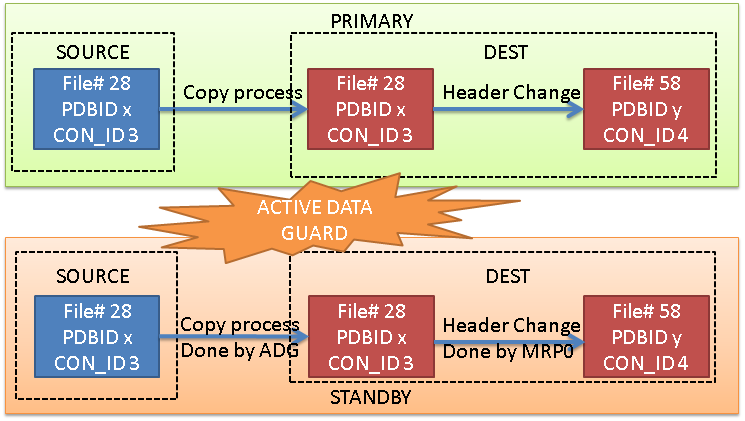 If you have ADG, the ADG itself will take care of copying the datafile on the standby site, from the source standby pdb to the destination standby pdb. Once the copy is done, the MRP0 will continue the recovery. The modification of the header block of the destination PDB is done by the MRP0 immediately after the copy (at least this is what I understand). In this case, the copy on the standby site doesn’t happen, and the recovery process just add the entry of the new datafiles in the controlfile, with status OFFLINE and name UNKNOWNxxx. However, the source file cannot be copied anymore, because the MRP0 process will expect to have a copy of the destination datafile, not the source datafile. Also, any tentative of restore of the datafile 28 (in this example) will give an error because it does not belong to the destination PDB. So the only chance is to restore the destination PDB from the primary. This is the case that I want to explain actually. Without the flag STANDBYS=none, the MRP0 process will expect to change the header of the new datafile, but because the file does not exist yet, the recovery process dies. We can then copy it manually from the source standby pdb, and restart the recovery process, that will change the header. This process needs to be repeated for each datafile. (that’s why it’s not a viable solution, right now). 08:46:41 SYS@CDBATL_2> create pluggable database LUDO from MAAZ; Pluggable database created. At this point, on the standby the alert log show that the SYSTEM datafile is missing, and the recovery process stops. Recovery stopped due to failure in applying recovery marker (opcode 17.34). Datafiles are recovered to a consistent state at change 10433175 but controlfile could be ahead of datafiles. We need to fix the datafiles one by one, but most of the steps can be done once for all the datafiles. What do we need to do? Well, the recovery process is stopped, so we can safely copy the datafiles of the source PDB from the standby site because they have not moved yet. (meanwhile, we can put the primary source PDB back in read-write mode). -- on primary 08:58:07 SYS@CDBATL_2> alter pluggable database maaz close immediate instances=all; Pluggable database altered. 08:58:15 SYS@CDBATL_2> alter pluggable database maaz open read write instances=all; Pluggable database altered. Now there’s the interesting part: we need to assign the datafile copies of the maaz PDB to LUDO. Sadly, the OMF will create the copies on the bad location (it’s a copy, to they are created on the same location as the source PDB). We cannot try to uncatalog and recatalog the copies, because they will ALWAYS be affected to the source PDB. Neither we can use RMAN because it will never associate the datafile copies to the new PDB. We need to rename the files manually. Then, because we cannot rename files on a standby database with standby file management set to AUTO, we need to put it temporarily to MANUAL. 10:24:21 SYS@CDBGVA_2> alter database rename file '+DATA/CDBATL/0A4A0048D5321597E053334EA8C0E40A/DATAFILE/system.825.866396765' to '+DATA/CDBGVA/0243BF7B39D4440AE053334EA8C0E471/DATAFILE/system.864.866397049'; alter database rename file '+DATA/CDBATL/0A4A0048D5321597E053334EA8C0E40A/DATAFILE/system.825.866396765' to '+DATA/CDBGVA/0243BF7B39D4440AE053334EA8C0E471/DATAFILE/system.864.866397049' * ERROR at line 1: ORA-01275: Operation RENAME is not allowed if standby file management is automatic. ORA-01275: Operation RENAME is not allowed if standby file management is automatic. standby_file_management is not PDB modifiable, so we need to do it for the whole CDB. 10:31:42 SYS@CDBGVA_2> alter system set standby_file_management=manual; System altered. 18:05:04 SYS@CDBGVA_2> alter database rename file '+DATA/CDBATL/0A4A0048D5321597E053334EA8C0E40A/DATAFILE/system.825.866396765' to '+DATA/CDBGVA/0243BF7B39D4440AE053334EA8C0E471/DATAFILE/system.864.866397049'; Database altered. 10:34:24 SYS@CDBGVA_2> alter system set standby_file_management=auto; System altered. We can now restart the recovery. This time all the datafiles have been copied (no user datafile for this example) and the recovery process will continue!! 🙂 so we can hit ^C and start it in background. ORA-16043: Redo apply has been canceled. The Data Guard configuration reflects the success of this operation. Of course, we do!! The datafile names of the new PDB reside in the wrong ASM path. We need to fix them! datafile 60 switched to datafile copy "+DATA/CDBGVA/0A4A0048D5321597E053334EA8C0E40A/DATAFILE/system.867.866398941"
datafile 61 switched to datafile copy "+DATA/CDBGVA/0A4A0048D5321597E053334EA8C0E40A/DATAFILE/sysaux.866.866398933"
I know there’s no practical use of this procedure, but it helps a lot in understanding how Multitenant has been implemented. I expect some improvements in 12.2!! pause "next... add singleton service"
cmd="srvctl add service -db CDBATL -service maazapp -serverpool CDBPOOL -cardinality singleton -role primary -failovertype select -failovermethod basic -policy automatic -failoverdelay 2 -failoverretry 180 -pdb maaz"
cmd="srvctl start service -db CDBATL -service maazapp -instance CDBATL_1"
cmd="srvctl status database -db cdbatl"
cmd="srvctl status service -service maazapp -db cdbatl"
pause "pause... please launch demo1_client.sh"
pause "next... relocate service from $current to $target"
cmd="srvctl relocate service -db CDBATL -service maazapp -currentnode $current -targetnode $target"
pause "next... close pdb immediate on old inst"
pause "next... modify service to uniform"
cmd="srvctl modify service -db CDBATL -service maazapp -cardinality uniform"
echop "Status of the PRIMARY DATABASE"
echos "Status of the STANDBY DATABASE"
echos "Data Guard configuration and status of the STANDBY database"
pause "please do tail -f on the apply instance"
pause "next... create new pdb ludo on primary "
echop "Create new pluggable database on the primary: "
echop "create pluggable database ludo admin user ludoadmin identified by ludoadmin;"
pause "next... create service for primary on both clusters"
echop "Create service for primary ROLE on the primary cluster (CDBATL) via SSH"
cmd="srvctl add service -db CDBATL -service ludoapp -serverpool CDBPOOL -cardinality singleton -role primary -failovertype select -failovermethod basic -policy automatic -failoverdelay 1 -failoverretry 180 -pdb ludo"
echo "\$ ssh raca01 $cmd"
ssh raca01 ". /home/oracle/.bash_profile ; $cmd"
echos "Create service for primary ROLE on the standby cluster (CDBGVA)"
cmd="srvctl add service -db CDBGVA -service ludoapp -serverpool CDBPOOL -cardinality singleton -role primary -failovertype select -failovermethod basic -policy automatic -failoverdelay 1 -failoverretry 180 -pdb ludo"
pause "next... start service on primary"
echop "Starting service on the primary via SSH"
cmd="srvctl start service -db CDBATL -service ludoapp"
pause "next... create read only service for physical standby on both clusters"
echop "Creating temporarily the readonly service for PRIMARY ROLE on the primary cluster (CDBATL) via SSH"
cmd="srvctl add service -db CDBATL -service ludoread -serverpool CDBPOOL -cardinality singleton -role primary -failovertype select -failovermethod basic -policy automatic -failoverdelay 1 -failoverretry 180 -pdb ludo"
echop "Starting the readonly service for PRIMARY ROLE on the primary cluster (CDBATL) via SSH"
cmd="srvctl start service -db CDBATL -service ludoread"
echop "Modifying the readonly service from PRIMARY ROLE to PHYSICAL STANDBY on the primary cluster (CDBATL) via SSH"
cmd="srvctl modify service -db CDBATL -service ludoread -role physical_standby -pdb ludo"
echos "Creating the readonly service for PHYSICAL STANDBY on the standby cluster (CDBGVA)"
cmd="srvctl add service -db CDBGVA -service ludoread -serverpool CDBPOOL -cardinality singleton -role physical_standby -failovertype select -failovermethod basic -policy automatic -failoverdelay 1 -failoverretry 180 -pdb ludo"
pause "next... start read only service"
echos "Starting the readonly service on the standby cluster"
cmd="srvctl start service -db CDBGVA -service ludoread"
pause "please connect to the RW service"
pause "next... dgmgrl status and validate"
pause "next... switchover to CDBGVA"
echos "Switchover to CDBGVA! (it takes a while)"
I feel the strong need to blog abut this very recent problem because I’ve spent a lot of time debugging it… especially because there’s no information about this error on the MOS. For a lab, I have prepared two RAC Container databases in physical stand-by. Real-time query is configured (real-time apply, standby in read-only mode). Following the doc, http://docs.oracle.com/database/121/SQLRF/statements_6010.htm#CCHDFDDG, I’ve cloned one local pluggable database to a new PDB and, because Active Data Guard is active, I was expecting the PDB to be created on the standby and its files copied without problems. The recovery process on the standby stopped with error. But, on the standby database, the PDB somehow was existing. I’ve tried to play a little, and finally decided to disable the recovery for the PDB (new in 12.1.0.2). ORA-65011: Pluggable database LUDO does not exist. SQL*Plus: Release 12.1.0.2.0 Production on Thu Aug 28 16:30:19 2014 Copyright (c) 1982, 2014, Oracle. All rights reserved. Connected to: Oracle Database 12c Enterprise Edition Release 12.1.0.2.0 - 64bit Production With the Partitioning, Real Application Clusters, Automatic Storage Management, OLAP, Advanced Analytics and Real Application Testing options 16:30:19 SYS@CDBGVA_1> alter session set container=LUDO; Session altered. 16:31:19 SYS@CDBGVA_1> alter pluggable database ludo disable recovery; Pluggable database altered. but the restore was impossible, because the controlfile was not knowing these datafiles!! So I’ve RESTARTED the recovery for a few seconds, and because the PDB had the recovery disabled, the recovery process has added the datafiles and set them offline. datafile 16 switched to datafile copy "+DATA/CDBGVA/01B431F9BDF51AB7E053334EA8C06877/DATAFILE/system.435.856802413"
datafile 17 switched to datafile copy "+DATA/CDBGVA/01B431F9BDF51AB7E053334EA8C06877/DATAFILE/sysaux.355.856802417"
Finally, I’ve enabled again the recovery for the PDB and restarted the apply process. 16:41:14 SYS@CDBGVA_1> alter session set container=LUDO; Session altered. 16:41:19 SYS@CDBGVA_1> alter pluggable database ludo enable recovery; Pluggable database altered. I’ve realized these days that the great list of articles by Oracle Alchemist does not contain any articles describing a little more in depth common roles and Users. But I would like to investigate a little more. Just to give you an idea, I have two PDBs (HR and HR2), each containing an HR schema. SQL> alter session set container=CDB$ROOT; Session altered. SQL> select NAME, CON_ID from v$containers; NAME CON_ID ------------------------------ ---------- CDB$ROOT 1 PDB$SEED 2 HR 3 HR2 4 4 rows selected. SQL> r 1* select username, con_id from cdb_users where username ='HR' USERNAME CON_ID ------------------------------ ---------- HR 4 HR 3 2 rows selected. As already pointed by the existing articles, I can’t create a common user into the root container without the c## prefix, unless I’m altering the hidden parameter _common_user_prefix. SQL> create user C##GOOFY identified by pippo; User created. SQL> grant create session, alter session to c##goofy; Grant succeeded. The user is common, so it appears in all the containers, I can check it by querying CDB_USERS from the root container. Then I create also a local user into the HR PDB. SQL> alter session set container=HR; Session altered. SQL> create user goofy identified by pippo; User created. SQL> grant create session, alter session to goofy; Grant succeeded. Do the roles obey to the same rules valid for the users? SQL> create role C##COUNTRY_ROLE container=ALL; Role created. Note that the error ORA-65049 is different from the ORA-65096 that I’ve got before. My conclusion is that the clause container of the create role and create user statements doesn’t make sense as you can ONLY create common users and roles into the root container and only local ones into the PDBs. SQL> create role REGION_ROLE container=CURRENT; Role created. Now, from the PDB I can see the two roles I can access, whereas from the root I can see all the roles I’ve defined so far: the common role is available from all the PDBs, the local role only from the db where it has been defined, just like the users. SQL> select role, con_id from cdb_roles where role like '%COUNTRY%' or role like '%REGION%'; ROLE CON_ID ----------------------------------------------- ---------- REGION_ROLE 3 C##COUNTRY_ROLE 3 SQL> alter session set container=CDB$ROOT; Session altered. SQL> select role, con_id from cdb_roles where oracle_maintained='N'; ROLE CON_ID ----------------------------------------- ---------- C##COUNTRY_ROLE 1 C##COUNTRY_ROLE 4 C##COUNTRY_ROLE 3 REGION_ROLE 3 4 rows selected. SQL> grant select on hr.countries to C##country_role; grant select on hr.countries to C##country_role * ERROR at line 1: ORA-00942: table or view does not exist SQL> alter session set container=hr; Session altered. SQL> grant select on hr.countries to C##COUNTRY_ROLE; Grant succeeded. SQL> grant select on hr.regions to REGION_ROLE; Grant succeeded. SQL> alter session set container=cdb$root; Session altered. SQL> select GRANTEE, OWNER, TABLE_NAME, PRIVILEGE, COMMON, CON_ID from cdb_tab_privs where owner='HR'; GRANTEE OWNER TABLE_NAME PRIVILEGE COM CON_ID -------------------- -------- ---------------- ------------- --- ---------- REGION_ROLE HR REGIONS SELECT NO 3 C##COUNTRY_ROLE HR COUNTRIES SELECT NO 3 2 rows selected. SQL> grant REGION_ROLE to goofy; Grant succeeded. SQL> grant REGION_ROLE to c##goofy; Grant succeeded. SQL> alter session set container=cdb$root; Session altered. SQL> grant C##COUNTRY_ROLE to c##goofy container=all; Grant succeeded. SQL> grant C##COUNTRY_ROLE to c##goofy container=current; Grant succeeded. SQL> grant select any table to c##goofy container=current; Grant succeeded. Ok, I’ve given the grants and I’ve never verified if they work, so far. Let’s try with the select any table privilege I’ve given in the last snippet. I expect C##GOOFY to select any table from the root container and only HR.COUNTRIES and HR.REGIONS on the HR PDB bacause they have been granted through the two roles. SQL> connect c##goofy/pippo; Connected. SQL> select count(*) from APEX_040200.WWV_FLOW_TABS; COUNT(*) ---------- 609 1 row selected. SQL> connect c##goofy/pippo@node4:1521/hr ERROR: ORA-01045: user C##GOOFY lacks CREATE SESSION privilege; logon denied Warning: You are no longer connected to ORACLE. SQL> select * from dba_sys_privs where grantee='C##GOOFY'; GRANTEE PRIVILEGE ADM COM ------------------------------ ---------------------------------------- --- --- C##GOOFY SELECT ANY TABLE NO NO C##GOOFY ALTER SESSION NO NO C##GOOFY CREATE SESSION NO NO 3 rows selected. SQL> grant create session, alter session to c##goofy container=all; Grant succeeded. SQL> select * from dba_sys_privs where grantee='C##GOOFY'; GRANTEE PRIVILEGE ADM COM ------------------------------ ---------------------------------------- --- --- C##GOOFY SELECT ANY TABLE NO NO C##GOOFY ALTER SESSION NO NO C##GOOFY CREATE SESSION NO NO C##GOOFY ALTER SESSION NO YES C##GOOFY CREATE SESSION NO YES 5 rows selected. Now I see that the grants give two distinct permissions : one local and the other common. If I revoke the grants without container clause, actually only the local one is revoked and the user can continue to login. To revoke the grants I would need to check and revoke both local and common privileges. SQL> revoke create session, alter session from c##goofy; Revoke succeeded. SQL> select * from dba_sys_privs where grantee='C##GOOFY'; GRANTEE PRIVILEGE ADM COM ------------------------------ ---------------------------------------- --- --- C##GOOFY SELECT ANY TABLE NO NO C##GOOFY ALTER SESSION NO YES C##GOOFY CREATE SESSION NO YES 3 rows selected. SQL> connect C##GOOFY/pippo; Connected. After that, I want to check the privileges given through the local and common roles. I expect both users to select from hr.countries and hr.regions since they have been granted indirectly by the roles. SQL> connect goofy/pippo@node4:1521/hr Connected. SQL> select count(*) from hr.regions; COUNT(*) ---------- 4 1 row selected. SQL> select count(*) from hr.countries; COUNT(*) ---------- 25 1 row selected. Yeah, it works as expected. SQL&gt; connect c##goofy/pippo@node4:1521/hr Connected. SQL&gt; select count(*) from hr.regions; COUNT(*) ---------- 4 1 row selected. SQL&gt; select count(*) from hr.countries; COUNT(*) ---------- 25 1 row selected. It also work, so everything is ok.
SQL> alter session set container=CDB$ROOT; Session altered. SQL> select grantee, GRANTED_ROLE, COMMON, CON_ID from cdb_role_privs where grantee like '%GOOFY' order by GRANTEE, GRANTED_ROLE; GRANTEE GRANTED_ROLE COM CON_ID ------------------------------ ------------------------------ --- ---------- C##GOOFY C##COUNTRY_ROLE YES 4 C##GOOFY C##COUNTRY_ROLE YES 3 C##GOOFY C##COUNTRY_ROLE YES 1 C##GOOFY C##COUNTRY_ROLE NO 1 C##GOOFY C##COUNTRY_ROLE NO 3 C##GOOFY REGION_ROLE NO 3 GOOFY C##COUNTRY_ROLE NO 3 GOOFY REGION_ROLE NO 3 8 rows selected. SQL> revoke C##COUNTRY_ROLE from C##GOOFY container=current; Revoke succeeded. SQL> alter session set container=hr; Session altered. SQL> revoke C##COUNTRY_ROLE from C##GOOFY container=current; Revoke succeeded. SQL> select grantee, GRANTED_ROLE, COMMON, CON_ID from cdb_role_privs where grantee like '%GOOFY' order by GRANTEE, GRANTED_ROLE; GRANTEE GRANTED_ROLE COM CON_ID ------------------------------ ------------------------------ --- ---------- C##GOOFY C##COUNTRY_ROLE YES 3 C##GOOFY REGION_ROLE NO 3 GOOFY C##COUNTRY_ROLE NO 3 GOOFY REGION_ROLE NO 3 4 rows selected. SQL> connect C##GOOFY/pippo@node4:1521/hr Connected. SQL> select count(*) from hr.countries; COUNT(*) ---------- 25 1 row selected. SQL> select count(*) from hr.regions; COUNT(*) ---------- 4 1 row selected. When granting privileges from the root container, keep in mind that container=current is the default even when the grantee or the role granted are common. When revoking the grants with a Multitenant architecture, keep in mind that there is a scope and you may need more than one statement to actually remove the grant from all the scopes. As always, I look for opinions and suggestions, feel free to comment!